KID Museum was abuzz this past Sunday, April 29, with over 400 kids and adults designing circuit boards, building constellation projectors, and dismantling old boom boxes and remote control cars during the second annual Spark Behind the Science Day. Visitors could apply their imagination and problem-solving skills at 10 different activity stations. The schedule included family workshops in robotics and electronics, as well opportunities to interact with a diverse group of STEM professionals who shared personal stories about what first inspired them to pursue their careers. 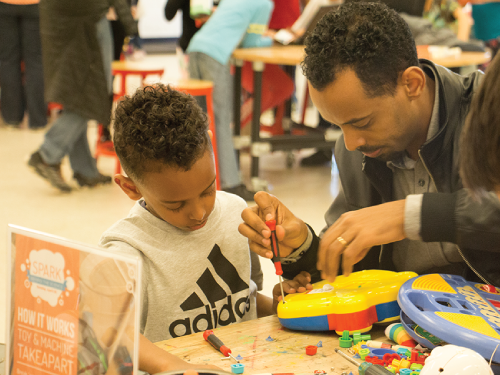 Not just a fun day for families, Spark Behind the Science Day is the centerpiece of an important research collaboration by KID Museum, Montgomery County Public Libraries, and George Mason University. Funded by a grant from the Institute of Museum and Library Services (IMLS), the project explores how family members engage in maker-based STEM learning with input from STEM experts, and seeks to generate a learning model that can be replicated in other community settings. One of KID Museum’s priorities is to reach across the socioeconomic spectrum and inspire a diverse new generation of innovators. In keeping with this goal, the museum worked with Montgomery County Public Schools’ Extended Learning Opportunities (ELO) program, to extend a Spark Behind the Science Day promotion to traditionally underrepresented students. The first 100 ELO families to register for the event attended free of charge, and all others received half-priced admission. Spark Behind the Science Day has become an increasingly powerful event for the entire community. Attendance was nearly double what it was last year, and this year’s program offered an expanded roster of activities, including two projects — designing an “all-inclusive” playground for children with disabilities, and creating no-sew fleece blankets for Children’s National Medical Center — that underscored how science can support human connection.